You will not be able to marry anyone until you have spoken to Maramal about marriage, even if you have already obtained an amulet from somewhere else. Maramal can be found in the Temple of Mara, but will also spend time in the Bee and Barb. If you go through with the ceremony, the wedding guests will congratulate you on the wedding. You should talk to your spouse before they leave the temple to discuss living arrangements, they will open up the conversation by saying, "Married? It doesn't feel like I thought it would, but I'm happy. We're married. I guess we'll need to decide where we're living, won't we? You can always stay with me." You can then choose either to live at your spouse's house or your own house, and wherever you decide to live can be changed later. The Dawnguard add-on allows you to turn your spouse into a vampire as a part of the Volkihar clan quest The Gift. This does not work as normal vampirism does, though, as your spouse will still show up with the Detect Life spell and will not use Vampiric Drain. Also your spouse will not have glowing orange or red eyes unlike other NPC's you will find throughout skyrim. With the Dragonborn DLC installed, spouses obtain a more bat like face with a split down the middle of the lip or in the case of an Argonian a split across the whole face. † The "Merchant" column lists only the merchant type for those NPCs who were already merchants prior to marriage. Maramal says to meet back "tomorrow, from dawn til dusk". Technically this is incorrect; if you first asked him to host the wedding at 1 a.m., he will conduct it at 12 a.m. next day. Simply try waiting some hours until Maramal begins his wedding dialogue. 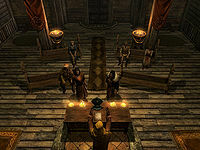 There are only a few female spouse followers that can be turned into vampires with the Dawnguard DLC installed, such as Uthgerd The Unbroken and any female houscarl. With Hearthfire if your spouse is kidnapped they will start to walk backwards (as a follower) will not attack. Esta página foi modificada pela última vez à(s) 02h03min de 30 de março de 2016.